Lemon Macaroon Pie before piping. Low quality presentation, high quality taste. Happy Day-After Thanksgiving:) I hope everyone who wanted to be with family and friends enjoyed their holiday. I wanted to post this earlier than today but didn’t have my to-do list organized well enough to bake the pie until the morning of turkey day. This is the recipe for a Lemon Macaroon pie. It is attributed to the Bon Appetit Dessert Cookbook by Barbara Fairchild and was done almost to the letter (as best I could). I wanted to do something besides the traditional pie fare, but I baked 3 pumpkin pies too. Blend the flour, sugar and salt in a food processor. Add the butter, using on/off turns until the mix resembles a coarse meal. Add the water and blend until moist clumps form. Remove from processor, wrap in plastic wrap and refrigerate for at least one hour. Set oven to 350F. Place rack in bottom third of oven. Remove dough from fridge and roll to 12 inch circle. Place in 9 inch pie dish and trim so there’s half-inch of overhang. Fold under and crimp the edges. Or not. I wasn’t in it for presentation at this particular outing. Freeze for 15 minutes. Remove from freezer, line bottom with foil and add beans or pie weights. Place in oven for 20 minutes or until edges or golden brown. Remove from oven, allow to cool, remove weights and foil. Set aside. Leave oven at temperature. Using an electric mixer, beat the eggs, egg yolks and salt in a large bowl. Add sugar and beat until thick and fluffy. Beat in coconut, whipping cream, lemon juice, lemon peel, butter and vanilla and almond extracts. Pour filling into crust. Bake until filling is golden and set, about 40 minutes. Remove from oven, cool completely and then chill in fridge until cool. About 3 hours. Using your electric mixer, beat the cream, sugar and vanilla in a small mixing bowl until stiff peaks form (please note this will take a while, even on whip setting). Fill a pastry bag with a star tip (or plastic bag with corner cut) and pipe around the edges of your pie. The pie is yummy and the lemon flavor is outstanding. There was one tiny slice left this morning and that was my breakfast. Olivia wants 4 of them for her upcoming 14th birthday. I’ll probably just make 2. 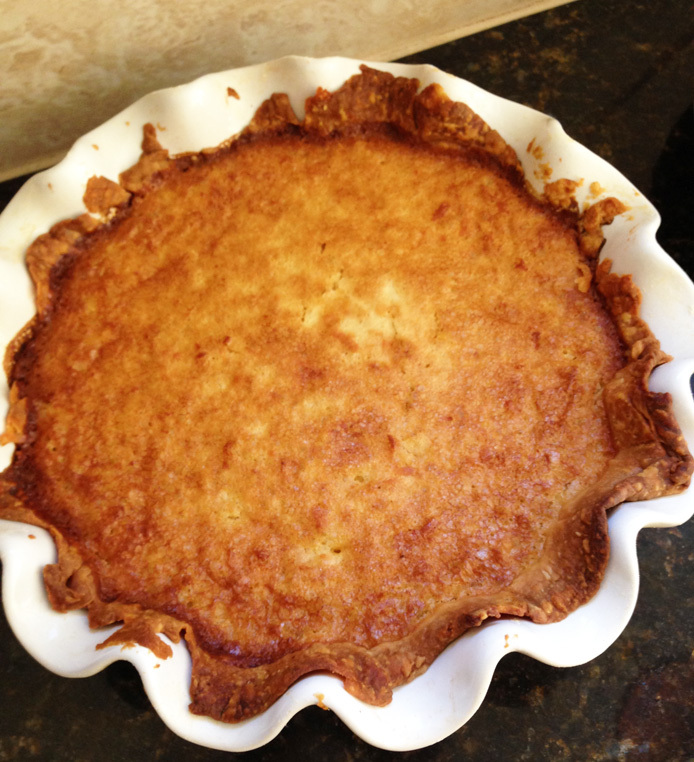 This entry was posted in Homemade Pie Crust Pies, Lemon Pies, Lots O' Butter Pies, Unique Pies and tagged Baking, Coconut Pies, Lemon Curd, Macaroon, Pie, Recipe, Unique Pie recipes by pieofthebeholder. Bookmark the permalink.